Carl receives a phone call twice a week from a friendly volunteer at Eskaton’s Telephone Reassurance Program. Alone in his apartment and in poor health, Carl enjoys the phone calls. On some days, it is his only conversation with a human being. Carl (right) enjoys visiting with Thomas (left) a Senior Companion volunteer with Eskaton’s Telephone Reassurance Program. 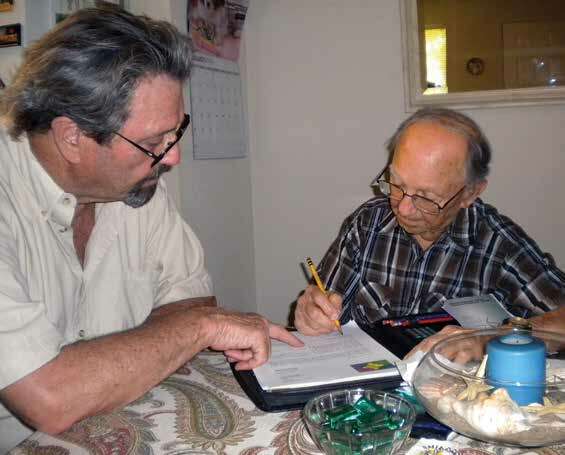 Recently, the Telephone Reassurance Program connected Carl with Thomas, a Senior Companion volunteer with the Telephone Reassurance Program. Thomas visits and takes Carl on outings.The two have become like “Mutt and Jeff.” They go out for lunch, shop, and enjoy an occasional game of Bocce ball. Each year, Telephone Reassurance volunteers make 76,000 calls to 600 lonely seniors in the Sacramento area. Carl was active and social in his younger years. Interestingly, he volunteered for 19 years as a Senior Companion after he retired. As a low-income Telephone Reassurance participant, Carl is also eligible for Eskaton Foundation’s Transportation Plus Program. Thank you for brightening Carl’s day!